This is WOW News 247: Igbo People Are The Only Tribe That will Survive it If Nigeria Divides - Says Governor Ayo Fayose! Igbo People Are The Only Tribe That will Survive it If Nigeria Divides - Says Governor Ayo Fayose! Ekiti State Governor, Ayodele Fayose has declared that in the event that the country is partitioned, only the Igbo nation could stand the test of time. Fayose stated this yesterday when the Ndigbo Community in Ekiti conferred him with the traditional title of ‘Nwanne – De – Namba at the Olukayode Stadium, Ado Ekiti during the Igbo Cultural Day. Fayose deplored those he called “fake political leaders”, who he said are only accessible to the people when they are looking for votes only to buy bullet proof cars and erect artificial walls around themselves so that they would not be accessible to the people after the poll. He said, “whatever anybody says, the Igbos are a unique people in the country. God forbid, if Nigeria should break, they are the only nation that can survive because they are industrious people. All the permanent structures found everywhere are owned by the Igbo people. “Wherever you go in the country, you will find an igbo man there. “No igbo man can vote for any other party in Ekiti State except the party I belong to because we are bonded with one another “, he said. The Governor bemoaned that women have been relegated in the scheme of things adding that his administration would provide for them in the 2017 budget of Ekiti State. 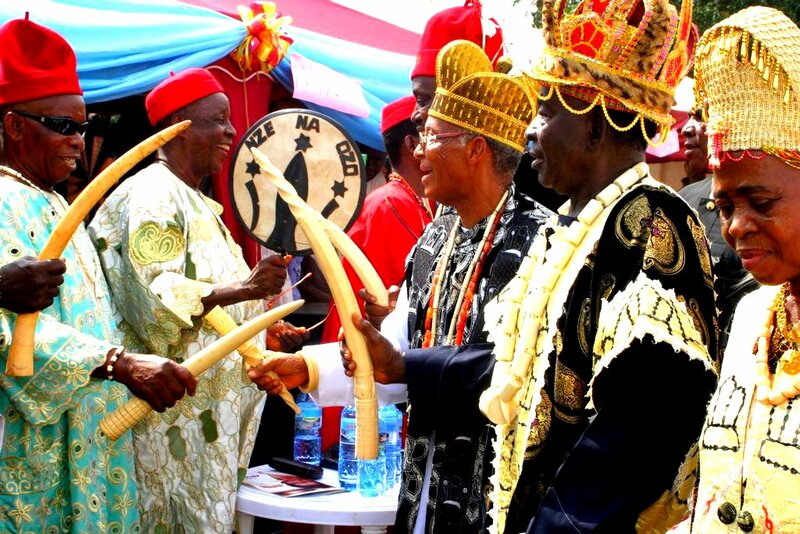 Earlier in his address, the President General of Ndigbo Community in South West, Chief Nathaniel Ezeonu said that the Igbo people in Ekiti State want to have their own market. He added that the traders want to acquire an uncompleted market along poly road Ado Ekiti which the state government has pegged at N380 million. Ezeonu pleaded with Governor Fayose to rescind the decision to shut down a popular market believed to be populated by igbo traders selling phones and other accessories. Ezeonu said that the theme of the Cultural Day titled: ‘Ndigno and Socio-economic Reality in Nigeria, Which way Forward’, was apt because the race have contributed more to the economic development of the country.